I’m told that bats feature in many people’s nightmares (I’ve kept several species, including Vampire Bats, and have found all to be quite calm, and even trainable in some cases, but that’s just me!). If bats themselves have nightmares, then surely the Amazonian Giant Centipede, Scolopendra gigantea, must make numerous appearances…the video linked below of one hunting bats in a cave will illustrate my point. Another of these aggressive beasts gave me more than a few sleepless nights, and stress-filled days, as well. 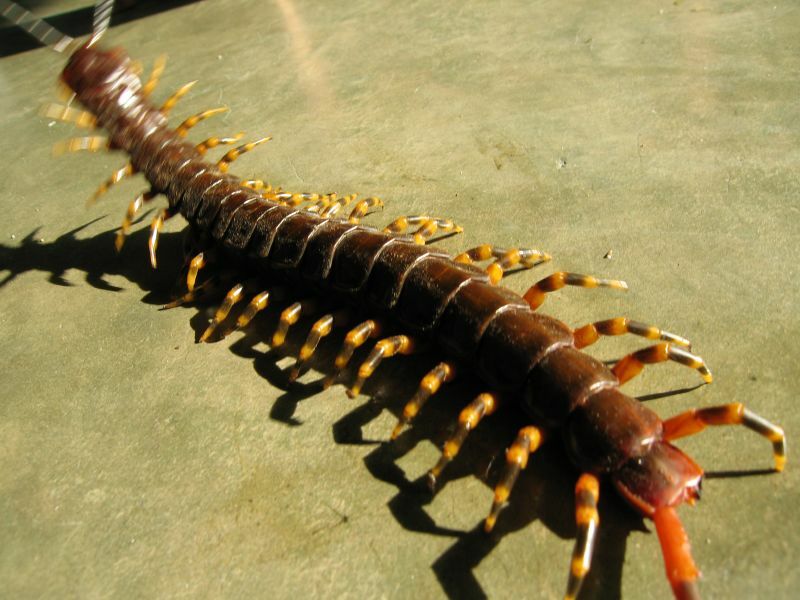 My own Giant Centipede nightmare began when an 11-inch-long specimen destined for a zoo exhibit escaped in a holding room. Among the animal keepers working there at the time was a woman who had lost several fingers to a Gorilla, a man who had been gored by a Gaur (a giant relative of the cow), and another who had been chased by a Kodiak Bear and carried an Anaconda tooth buried in his wrist (yours truly). Each of us had also helped round-up formidable escapees, including Spitting Cobras, Cassowaries and Snow Leopards, yet to the person we were terrified of picking up anything without first checking that the savage little invertebrate was not lurking below! Such is the reaction of many who have witnessed first-hand an agitated or hungry Giant Centipede in action. The head rears up and whips violently back and forth, drawing attention to the huge, sharp, venom-injecting fangs (known as the forcipules, or maxillipeds), which seem almost impossible to avoid. 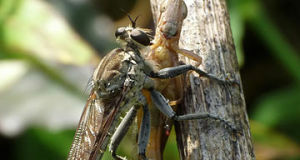 Those who have seen the vicious wounds that these fangs can inflict on even large prey animals steer well clear of these ultimate invertebrate predators. There is simply no place to grab a centipede, as its flexibility is unrivaled in the animal kingdom – most snakes pale in comparison (the animal being held in the photo is dead). Even if one succeeded in reaching the area just behind the head, the hard, pointed rear legs would be brought to bear on the skin, causing intense pain not only from trauma but also via irritating chemicals that are released in stressful situations…most enemies let go of the head, and are immediately bitten. 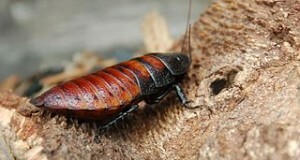 Centipedes belong to the Invertebrate Class Chilopoda, which contains over 3,000 species. Actually, we have no idea how many exist – several years ago a new species was discovered in NYC’s Central Park, in an area trod daily by thousands of people (please see article below)…imagine what lurks deep below tropical forest floors! Arkive Video of a Giant Centipede hunting bats in a cave. New Centipede Discovered in Central Park (Note: error in article – centipedes are predators, and do not consume leaf litter). Whenever my 3 sons and I are in the bushveld, we are ALWAYS equipped with various buckets and stuff to collect all sorts of spiders, scorpions and/or snakes…IF we are lucky! Our collections vary from baboon spiders, black widows, even six eyed dessert crab spider up to the dangerous buteo scorpion families….BUT upon finding any kind of centipede, we take real precaution, due to all points you have mentioned in your article. 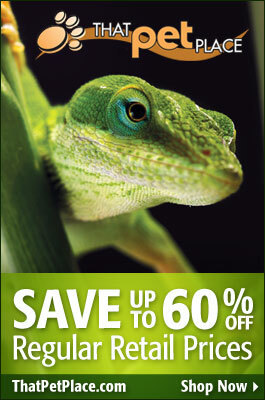 These guys are real beauties (our big guys only get +-16cm long), but beware…and so they are the only guys we would let go! I may not be too loud but we even have some brown button spiders residing INSIDE our home…late in the evenings they emerge from under the sofa, out of the standing lamp or elsewhere and wait in their nets for ants, moths etc…we even have a violin spider living under one of our broken bath tiles! So thanks for just another cool article! Nice to hear from you again…thanks so much for the interesting story; I’m sure you have my arachnid fans here salivating…me as well! Wow….I eagerly await the resolution of this story. Are escapes fairly common at zoos? Or the Bronx Zoo 😉 Just today I saw the article about the escaped Egyptian cobra at the Bronx Zoo! Hello Brett, Frank Indiviglio here. Nice to hear from you again. Every zoo has had their escapes…I’ve worked at several and have assisted in recovering Bears, snow leopards, gibbons, king cobras, cassowories (perhaps the worst of the group!) and so on; here’s a related article on a king cobra escape that you might enjoy. I gave an interview to the Wall St Journal and to ABC News on the cobra situation…basically let them know that rooms holding venomous snakes are escape proof, so the animal is likely contained somewhere in the room (I do not know the details, where it was kept, etc. ); the building itself is also escape proof, so the public is in no danger. The staff there is very good at their jobs and I’m sure will handle the situation appropriately. I know I’m finding this article almost 4 years after it was written, but I feel compelled to comment. I have a horrible, paralyzing phobia of centipedes that is at conflict with my general fascination with all animals (especially the creep-crawlies). Living in Nepal, it’s been hard for me to enjoy walks through the jungle without keeping an eye out for even the 12cm varieties that the village kids gleefully warn me about. It honestly makes me feel loads better to know that experts in the field (you and your colleagues) all seem to have a healthy fear and respect for these guys. Thanks for the information, Frank!